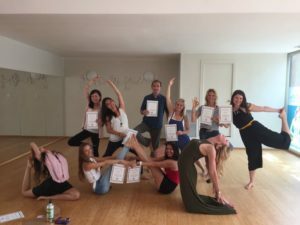 We at Yogalinda are proud and happy that our graduates have fulfilled their dreams of acquiring a deeper understanding of Yoga learning by being part of our Hot Yoga Teacher Training. You can next see what some of our graduates are doing, now that their dreams have come true, and take a look at their current projects. Read about our trainings (28 day intensiveand 10 months). Join us! If you are one of our former students and wish to tell us about your experience, please, write us at info@yogalinda.es, we will be more than happy to keep supporting your career! 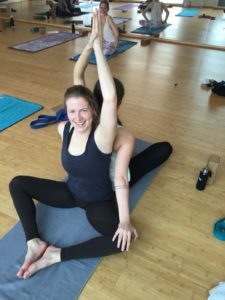 Since completing her RYTT at Yogalinda Sarah now teaches at four different yoga studios in Bloomington, Indiana (USA) and surrounding areas, teaching ten to fifteen classes a week. She is also the Studio Manager at Ekah Yoga a small yoga co-op. Join her for Costa Rica Yoga Immersion Retreat March 10-17, 2018. Sarah (Skip) began practicing yoga regularly in 2011. She enjoys the challenge of a hot class with the balance of asanas and pranayamas. Yoga has helped her keep her stress and anxiety in check. As her passion of yoga grew with each class she confesses she fostered a slight addiction to yoga. Her love for travel brought her to complete her 200 Hour Teacher Training Certification from Yogalinda in Barcelona, Spain with certification in Hot Vinyasa Yoga in 2016. Since then she had a wrist injury unrelated to yoga and underwent two surgeries. Yoga has given her the tools to rebuild strength and increase mobility mindfully with patience and awareness. She brings an understanding that everybody is different and yoga can be adapted to fit your own specific needs. She enjoys the creativity of Vinyasa flow and all the possibilities for personal expression. She hopes to cultivate a continual awareness of mind and body with each breath as it guides you throughout your own practice so you can live mindfully on and off the mat. 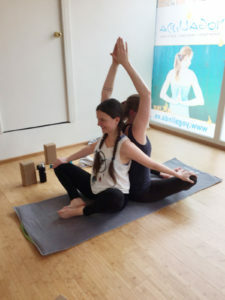 Lara first came to know Yoga without explicitly knowing it was ‘Yoga’ within her professional dance studies in Germany, the Netherlands and Spain. She was introduced to different styles and variations of Yoga in her dance practice, which became a nourishing grounding balance to her daily dance training. Yoga provided a powerful tool to prepare the body and mind for performances and a realm of relaxation and connection with the body, mind and soul. 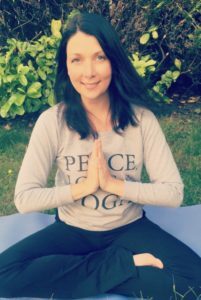 This made her set off to educate herself more into various styles of Yoga and fulfilling her desire to complete a Yoga teacher training guided her to Yogalinda in 2016 where she completed her ‘Hot Vinyasa Yoga’ certification. Lara is continuing her path and studies, enjoying sharing her findings in Vinyasa, Hatha, Yin, Aerial Yoga, Meditation and Mindfulness and other related movement practices to her students at Yogalinda Hot Yoga and out other studios in Barcelona. Find Lara’s classes in our schedule, she is a smile person with a great energy! “I started my yoga journey 4 years ago in Toronto. I started practicing at Moksha Yoga Etobicoke after I bought a one month unlimited pass. After the first class I became hooked. Moksha Yoga helped introduce me to the world of yoga and the healing it brings both physically and mentally. I made the decision to deepen my practice and I have never regretted my decision since. This training opened myself up into a whole new world. Currently, I have been teaching yoga for the ladies at my work at lunch-time, as well as teaching family and friends on my free time. My goal for the next few months is to slowly integrate myself into the studio I started at, eventually teaching the Vinyasa class that the studio offers. Thank you Heather and Lezanne for the most amazing month in Barcelona”. Inma was born in Seville and has been living in Madrid since 2008. For eight years she usually practiced Hatha Yoga, guided by her friend and mentor, Verónica Astesana. Because of her natural attraction to everything that is new and challenging, she discovered new styles of Yoga during her path. She studied techniques based on breathwork, stomach vacuum, and postural re-education, a technique that is now known as Hypopressure and practiced in Yoga as Uddiyana Bandha. She is a certified Vinyasa Yoga teacher, completed under the supervision of Heather Anderson at Yogalinda. She’s also a Prenatal Yoga teacher by Escuela Omma, where, with the guidance of Montse Cob, she studied in depth the female aspects of Yoga, and thanks to her, she has learned about all the subtle aspects that make each woman unique. Kayla has been a proud yogi for over a decade. After her first class at the young age of 14, she was hooked; she loved the calming energy, twisting herself into crazy poses and the flexibility she gained through the practice. Throughout the last 12 years she has dabbled with various types of yoga, but has found her love through vinyasa flow. Kayla’s passion for yoga is evident in her daily life, demeanor and the way she takes care of her body. She has learned through yoga how utilizing her breath can calm her worry prone and anxious mind, and, she has gained a greater understanding of who she is. 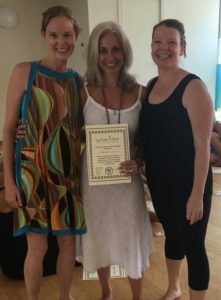 Kayla completed her 200 hour teacher training in February of 2016 at Yogalinda, a studio located in Barcelona, Spain. It was a soul searching experience in which she quit her job and left for Spain to pursue a dream that was placed on her heart. Kayla is also in the process in obtaining another 200 hour certification through Soul. Full School of Yoga. She has been seen teaching at local recreation centers, farmer’s markets, and leading classes at her office. She is also a teacher at SoulSpace Yoga Community in Fort Worth, TX. Kayla specializes in vinyasa flow and sculpt classes – yoga and weights combo. 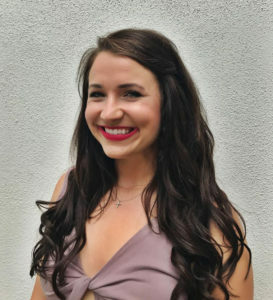 She has a desire to lead others through their practice, and her goal is to inspire those she teaches with her contagious energy and fun, yet challenging classes.